Two of the world’s most dynamic cities, Dubai and Singapore, have begun revealing their strong intentions to make this new type of transportation successful. Dubai’s Road and Transport Authority (RTA) announced that Volocopters will be available as soon as this summer. Dubai has issued different contracts and talked with various companies that are creating these flying drones. 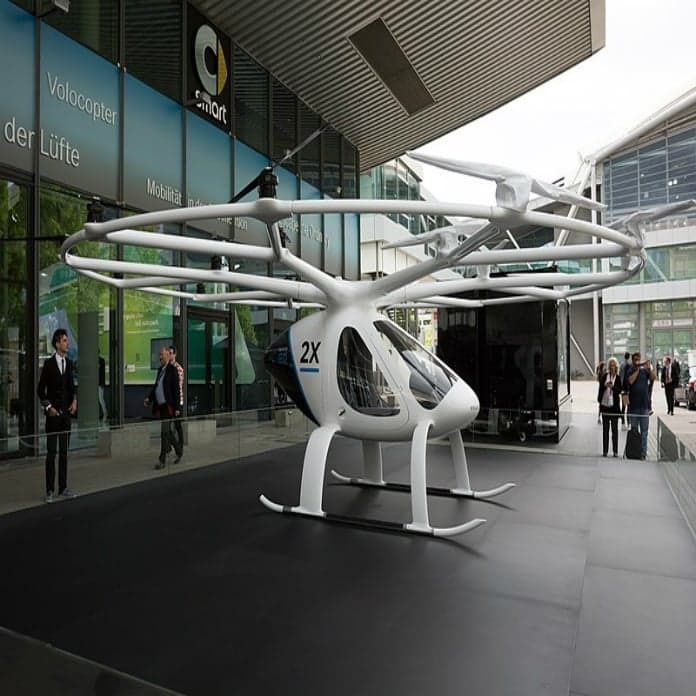 Its first contract was with the German Company Evolo who founded the NC200 Volocopter with a top speed of 100 miles per hour. Another deal was associated with Ehang 184 for its Autonomous Aerial Vehicle (AAV), a single-person quadcopter, which was displayed at the World Government Summit 2017 in Dubai. Moreover, Singapore unveiled their plan during The Business Times Leaders’ Forum to invest in flying driverless drones that aim at taking customers anywhere in the city. There is no doubt that flying drones could have a massive impact on any city it is introduced to. This new transportation mode is advancing rapidly as well as its competition, therefore, we can expect reasonable pricing for this modernized taxi service. Additionally, this new mean of transportation can massively help small and overcrowded cities with traffic congestion and problems. Interestingly, it is stated that the Volocopter 2x is safe and quiet for the environment. Our world is in a constant state of technology disruption. In the transportation industry specifically, we have seen new advancements in recent years such as ride-sharing services, hyper trains, autonomous cars, and now, flying drones. The transportation industry is evolving and it is very likely that different countries around the world are going to follow this new path of innovation.